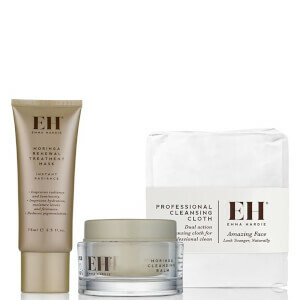 Experience a rejuvenating cleanse with Emma Hardie Moringa Cleansing Balm and Professional Cleansing Cloth, a luxurious daily cleanser that works to lift away makeup and impurities while revitalising dull skin. Enriched with antioxidant Moringa Seed extract, Wild Sea Fennel and Vitamin E, the nourishing balm delivers balancing, hydrating and purifying properties; it performs a deep cleanse, eliminating eye and face makeup while decongesting and refining the appearance of pores. It also contains a cocktail of Grape Seed and Sweet Almond Oils, rich in essential fatty acids to help plump and soften the complexion. Brightening and hydrating, its deep cleansing properties are enhanced with the professional cleansing cloth included. The cloth is made from unique micro-fibre and backed with muslin to help insulate heat for ultimate compressing and skin cushioning. The micro-fibre side delivers deep yet gentle pore cleansing and makeup removal while smoothing the appearance of fine lines. I never liked balms until i tried Emma Hardie. it is gentle yet its able to breakdown tough, waterproof makeup effectively without hard scrubbing! It smells so good too and i love that it comes with a muslin cloth. I personally love cleansing balms as they are more gentle and suitable for my dry skin. This Emma Hardie one is amazing! It's super gentle and removes makeup (even waterproof mascara!) so effectively. Plus, it honestly smells so good! Highly recommend to anyone. 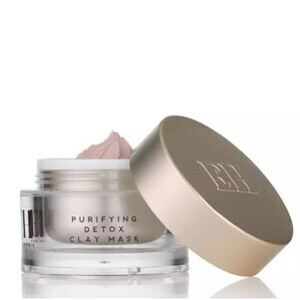 This cleansing balm with moringa oil, smell nice and making the skin soft. It takes all the moisturizing benefits of oils and puts them into an emollient base that helps to instantly melt away even the most stubborn makeup, leaving your pores cleaned out. And I like the muslin cloth very much, it has two surface. One is cotton, another is muslin.